A relatively healthy energy snack! Magnesium in Organic Cacao nibs contributes to normal functioning of the nervous system. The Cacao Tree (Theobroma) which means 'food of the gods' is native to the lush South Maerican forests and has been used for over 3,000 years. The Cacao beans are broken into nibs and separated from their shells. 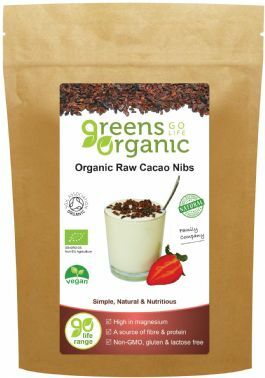 These crunchy nibs have a deliciously chocolatey aroma and a rich dark flavour. Magnesium in Organic Cacao nibs contributes to normal functioning of the nervous system. Suggested use - Perfect for snacking throughout the day. Can be sprinkled on smoothies, desserts, cereals and more. Blend all of the ingredients together until smooth, pour in to a glass, sit back, relax and enjoy!